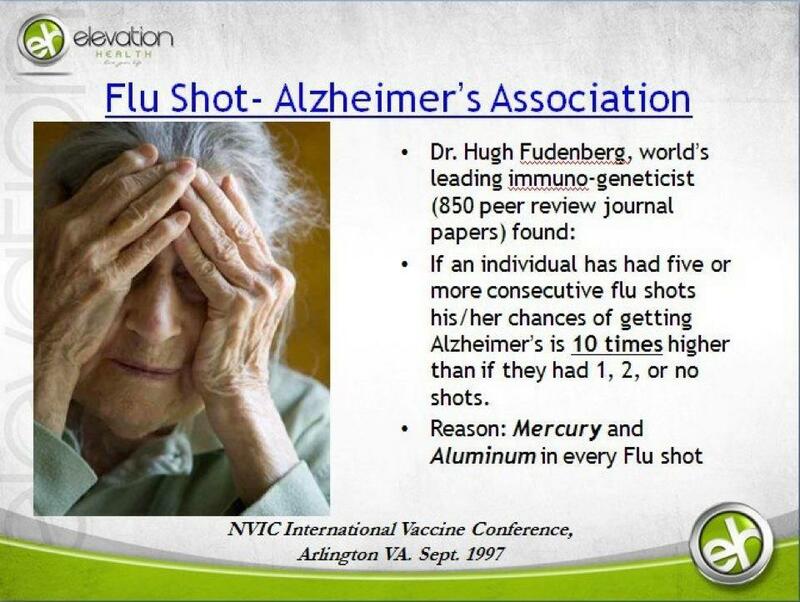 "According to Hugh Fudenberg, MD (http://members.aol.com/nitrf), the world's leading immunogeneticist and 13th most quoted biologist of our times (nearly 850 papers in peer review journals), if an individual has had five consecutive flu shots between 1970 and 1980 (the years studied) his/her chances of getting Alzheimer's Disease is ten times higher than if they had one, two or no shots. I asked Dr. Fudenberg why this was so and he said it was due to the mercury and aluminum that is in every flu shot (and most childhood shots). The gradual mercury and aluminum buildup in the brain causes cognitive dysfunction. Is that why Alzheimer's is expected to quadruple? Notes: Recorded from Dr. Fudenberg's speech at the NVIC International Vaccine Conference, Arlington, VA September, 1997. Quoted with permission. Alzheimer's to quadruple statement is from John's Hopkins Newsletter Nov 1998." ----Ted Koren, D. C. http://www.odyssee.net/~expodome/autism.htm#Top Koren Publications (800-537-3001).